Brooklyn middle-schooler MaKayla can only think about one thing--taking her double Dutch team all the way to the National Jump-off at Madison Square Garden. That is, until her mother breaks the news. Kayla has to spend the summer at her aunt's house in North Carolina while her parents work out their problems . . . or decide to call it quits.Kayla does not feel at home in the South, and she certainly doesn't get along with her snooty cousin Sally. It looks like her Jump-off dreams are over. Hold the phone! Turns out, double Dutch is huge in the South. She and Sally just need to find two more kids for a team. And a routine. And the confidence to stand up to the double Dutch divas who used to be Sally's BFFs. Time to show those Southern belles some Brooklyn attitude! There is just a moment where you read a short blurb of a book and you know instantly that this is a book you want to read. For me seeing reference to Disney Channel's 'The Proud Family' and 'Jump In!' was that moment where I knew I wanted to read this book. I remember when I was younger I would come home and turn on the TV and 'The Proud Family' would be on. I would sit down and suddenly become immersed in Penny Proud's life of family, friends, and school. My favorite characters were Sugar Mama and her dog Puff. Even now just thinking about them makes me smile. As for double dutch, there are certain people that will never be able to double dutch and that person is me...at least that is what my mom told after breaking two pairs of glasses. Don't ask. Anyways, enough of memory lane. In Love Double Dutch we take a trip from Brooklyn to North Carolina with character, MaKayla as her hopes of taking her team to the National Double Dutch competition are soon left behind. However, being sent to a summer camp just might bring her dream of a national title back into reality. 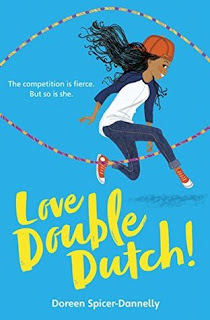 The idea of forming a story around the sport, Double Dutch, is such a brilliant way of making this a current, relatable and timely novel. Bringing up topics such as divorce, new friendships, first relationships and so much more that allow readers to connect more internally with their own lives. This was a book that I sat down with one morning and within a few hours I had reached the end. This was a book that I needed to remind me of the moments of joy I had when watching 'The Proud Family' and 'Jump In!.' This is the book that I encourage you to check out. A simple but absolutely stellar read.